It’s been twenty years since Harry Potter and the Philosopher’s Stone was first published, and we still can’t get enough of the wizarding world. Software from Botnik Studios has taken it upon itself to produce the latest sequel to the Potter universe with hilarious results. Harry Potter and the Portrait of What Looked Like a Large Pile of Ash is a fan fiction of sorts written by a computer algorithm. Staff at Botnik injected the seven existing Potter novels into their predictive text keyboard, which generated the sequel by analysing the probability of certain words following others. The software is open source and available for anyone to use. The novels contain a total of 1,084,170 words – plenty of content for the software to get a feel for Rowling’s world. Indeed, the characters and language are very much authentic. However the algorithm has not yet mastered plausible plot development. 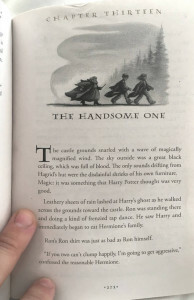 ‘”Ron’s the handsome one”, muttered Harry. . .
“Voldemort, you’re a very bad and mean wizard”, Harry said savagely. Hermione nodded encouragingly.